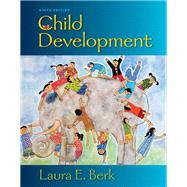 , by Berk, Laura E.
A best-selling, topically organized child development text, Berk's Child Developmentis relied on in classrooms worldwide for its clear, engaging writing style, exceptional cross-cultural and multi-cultural focus, rich examples, and long-standing commitment to presenting the most up-to-date scholarship while also offering students research-based, practical applications that they can relate to their personal and professional lives. Berk takes an integrated approach to presenting development in the physical, cognitive, emotional, and social domains; emphasizes the complex interchanges between heredity and environment; and provides exceptional attention to culture. Laura Berk, renowned professor and researcher, presents the latest theories and findings in the field to students in a manageable and relevant way. Berk's signature storytelling style invites students to actively learn beside the text's "characters," who experience real issues in development, including physical, cognitive, and peer challenges, as well as parenting and educational concerns. Berk also helps students connect their learning to their personal and professional areas of interest. Her voice comes through when speaking directly about issues students will face in their future pursuits as parents, educators, heath care providers, social workers, and researchers. As members of a global and diverse human community, students are called on to intelligently approach the responsibility of understanding and responding to the needs and concerns of children. While carefully considering the complexities of child development, Berk presents classic and emerging theories in an especially clear, engaging writing style, with a multitude of research-based, real-world, and cross-cultural examples. Strengthening the connections among developmental domains and among theory, research, and applications, this edition's extensive revision brings forth the most recent scholarship, representing the changing field of child development. Note:MyDevelopmentLab does not come automatically packaged with this text. To purchase MyDevelopmentLab, please visit: www.mydevelopmentlab.com. Laura E. Berk is a distinguished professor of psychology at Illinois State University, where she has taught child and human development to both undergraduate and graduate students for more than three decades. She received her bachelor’s degree in psychology from the University of California, Berkeley, and her master’s and doctoral degrees in child development and educational psychology from the University of Chicago. She has been a visiting scholar at Cornell University, UCLA, Stanford University, and the University of South Australia. Berk has published widely on the effects of school environments on children’s development, the development of private speech, and recently, the role of make-believe play in development. Her research has been funded by the U.S. Office of Education and the National Institute of Child Health and Human Development. It has appeared in many prominent journals, including Child Development, Developmental Psychology, Merrill-Palmer Quarterly, Journal of Abnormal Child Psychology, Development and Psychopathology, and Early Childhood Research Quarterly. Her empirical studies have attracted the attention of the general public, leading to contributions to Psychology Today and Scientific American. She has also been featured on National Public Radio’s Morning Edition and in Parents Magazine, Wondertime, and Reader’s Digest. Berk has served as research editor of Young Children and consulting editor of Early Childhood Research Quarterly. Currently, she is associate editor of the Journal of Cognitive Education and Psychology. She is a frequent contributor to edited volumes on early childhood development, having recently authored chapters on the importance of parenting, on make-believe play and self-regulation, and on the kindergarten child. She has also written the chapter on development for The Many Faces of Psychological Research in the Twenty-First Century (Society for the Teaching of Psychology), the article on social development for The Child: An Encyclopedic Companion, the article on Vygotsky for the Encyclopedia of Cognitive Science, and the chapter on storytelling as a teaching strategy for Voices of Experience: Memorable Talks from the National Institute on the Teaching of Psychology (Association for Psychological Science). Berk’s books include Private Speech: From Social Interaction to Self-Regulation, Scaffolding Children’s Learning: Vygotsky and Early Childhood Education, Landscapes of Development: An Anthology of Readings, and A Mandate for Playful Learning in Preschool: Presenting the Evidence. In addition to Child Development, she is author of the best-selling texts Infants, Children, and Adolescents and Development Through the Lifespan, published by Pearson. Her book for parents and teachers is Awakening Children’s Minds: How Parents and Teachers Can Make a Difference. Berk is active in work for children’s causes. In addition to service in her home community, she is a member of the national board of directors and chair of the Chicago advisory board of Jumpstart, a nonprofit organization that provides intensive literacy intervention to thousands of low-income preschoolers across the United States, using college and university students as interveners. Berk is a fellow of the American Psychological Association, Division, 7: Developmental Psychology. Early Deprivation and Enrichment: Is Infancy a Sensitive Period of Development? What Do Intelligence Tests Predict, and How Well? Constructing an Identity: Who Should I Become? To What Extent Do Boys and Girls Really Differ in Gender-Stereotyped Attributes?